I just came home from a trip to Hungary. My family always jokes about the tiny “Euro-vators,” and as an OT, I often wonder how people manage these smaller, and by our standards, inaccessible areas. However, I noticed the light switches in our short term stay apartment one night. I had my arms full of luggage and groceries and realized I was hitting the light switches with just the side of my body. Eventually, I was able to take a closer look at them. These are amazing. They are large, and require very little effort to activate in either direction. I used my finger, palm of my hand, elbow, and even just the side of my body to flip the switch. This makes it useful for people who have arm and hand weakness or paralysis. The other detail I appreciated is the icon in the bottom right hand corner indicating whether the switch was the light or the doorbell. I could see this being useful in my assisted living buildings, where we end up putting tape over the light switch that controls the electric outlets to differentiate it from the switch that controls the overhead light. If the icon was larger, it would be easier for those with low vision to see. I saw this design everywhere we went in Hungary and Serbia. 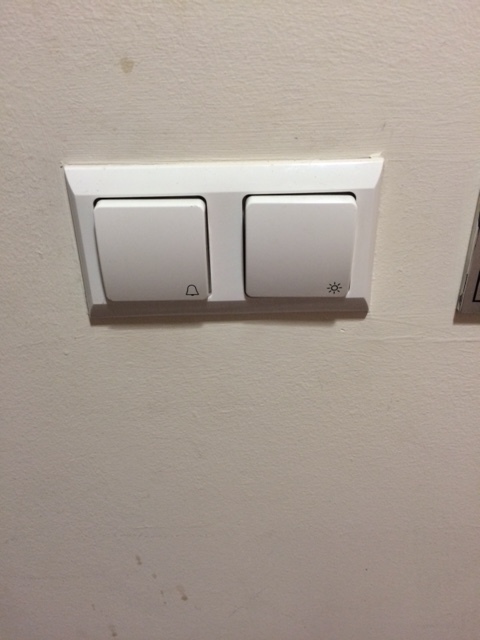 What do you think of the European light switches?